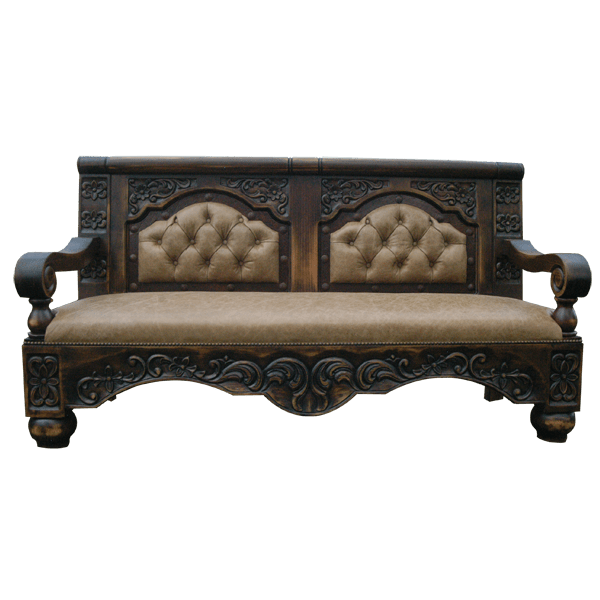 Complement your Western décor with the elegant and sophisticated details of this handcrafted, Western style settee. 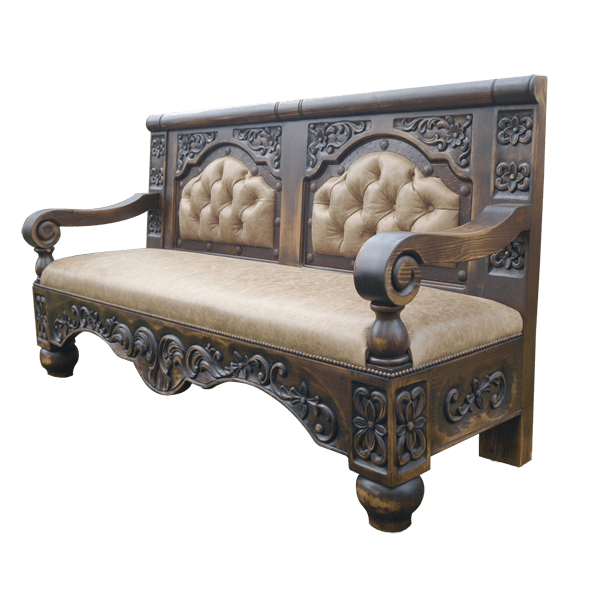 The settee features a solid wood, rectangular seat back, and each side of the seatback is adorned with an exquisite, arched panel. The two, padded panels are upholstered with opulent, full grain leather, and the leather is adorned with a spectacular, button tuft design. The sides of each panel have hand forged, iron conchos intermittently hand tacked to its border. 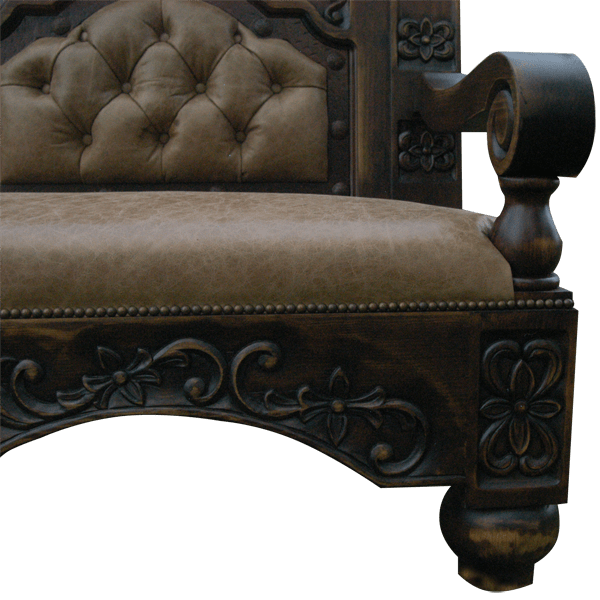 The entire upper portion of the seat back is enhanced with marvelous, hand carved, floral and scroll details. The seat is well padded and it is upholstered with matching, full grain leather, and accompanying the seat are elegant, scrolled armrests. All of the upholstery is precision hand tacked to the frame with beautiful, gilt nails. 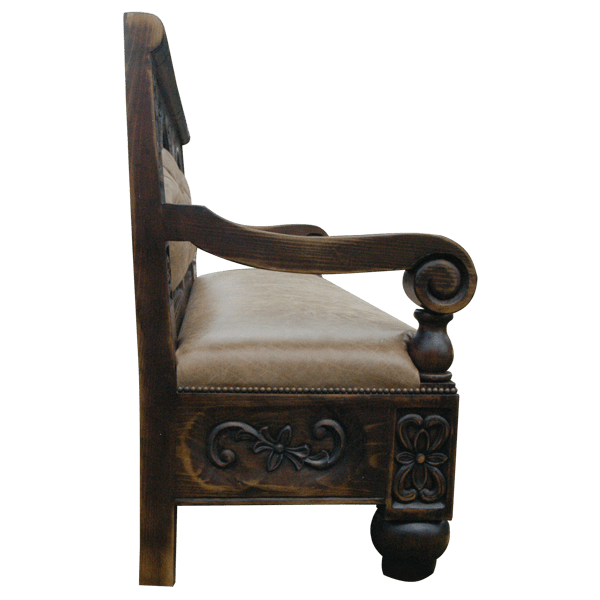 The front of the seat has a Spanish colonial style apron, and the entire apron is embellished with gorgeous, hand carved, floral details. The floral designs are repeated on the lateral sides of the settee. The settee is supported in front by sturdy, hand turned, tapered feet, and in back with rectangular cut feet. It has a classic, dark finish, and it is made with the best, sustainable, solid wood available. The settee is 100% customizable.